Showing 1 - 20 of 173 results. 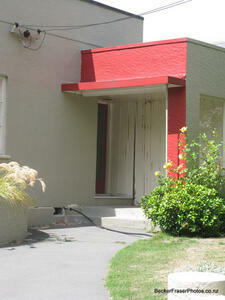 A woman taking a photograph of a gutter on Bracken Street in Avonside. The footpath on the right has visibly warped. 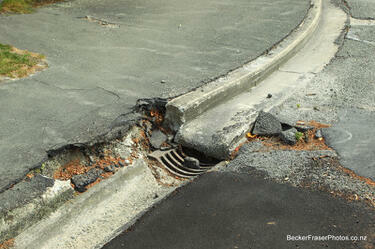 Damage to a footpath on Bracken Street in Avonside. 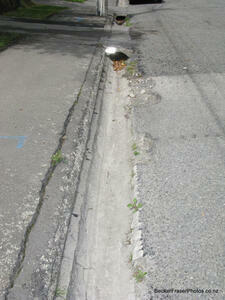 A gutter on Bracken Street in Avonside, with the footpath and road beside it showing cracks on their edges from the 4 September 2010 earthquake. A gutter on Bracken Street in Avonside. 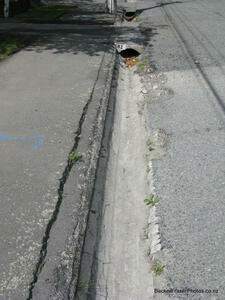 The gutter and the road and footpath beside it have been cracked and warped by the 4 September 2010 earthquake. A gutter on Bracken Street in Avonside. 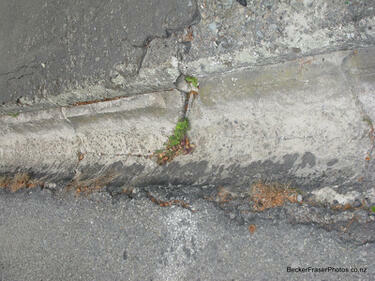 Large cracks can be seen on the edges of the footpath above it as a result of the 4 September 2010 earthquake. A view down Bracken Street in Avonside. A power pole has been propped up by a concrete block because the asphalt around it has sunk as a result of the 4 September 2010 earthquake. 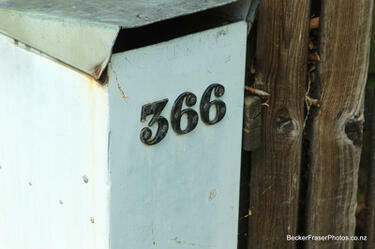 A letter box at 366 Avonside Drive. 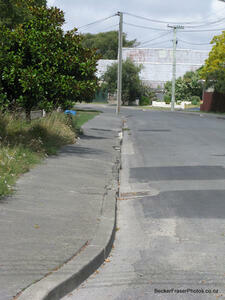 A section of the footpath on Galbraith Avenue in Avonside that has been covered in dirt. 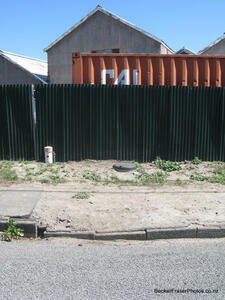 Behind it is one of the septic tanks that were installed in front of Avonside properties to allow residents to use their toilets after the 4 September 2010 earthquake. 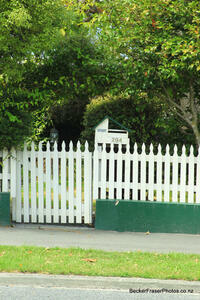 A picket fence on Robson Avenue in Avonside. 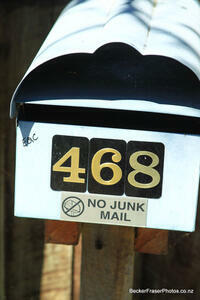 The letter box of a house on Avonside Drive. Someone has written EQC on it. 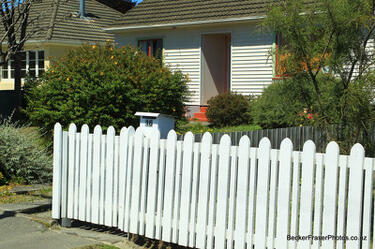 A picket fence at 294 Avonside Drive. Cracks can be seen in the concrete of the fence's bottom section. 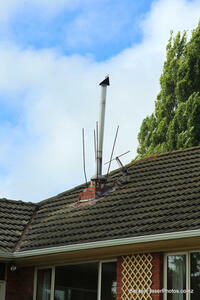 Damage to a gutter on Avonside Drive. The height difference between the two broken sections shows how the land has moved as a result of the 4 September 2010 earthquake. 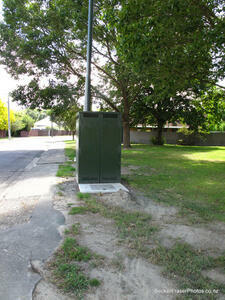 A view down Galbraith Avenue in Avonside. The footpath and road have been cracked by the 4 September 2010 earthquake. 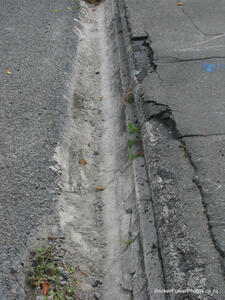 Small deposits of dry liquefaction silt can be seen on patches of the road. 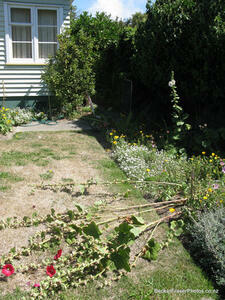 Some flowers that have fallen over in the garden of a house on Galbraith Avenue in Avonside. 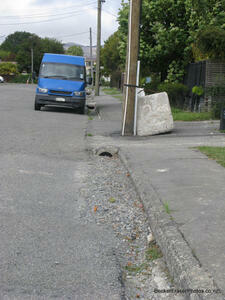 A buried septic tank on Avonside Drive. These tanks were installed in front of Avonside properties to allow residents to use their toilets after the 4 September 2010 earthquake. Bare patches of ground at Sullivan Park in Avonside. 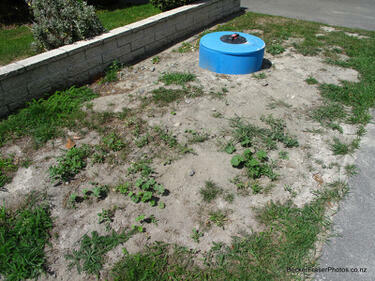 The bare patches mark where liquefaction covered the grass after the 4 September 2010 earthquake. 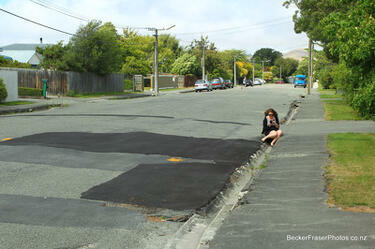 Damage to the footpath and road on Galbraith Avenue can also be seen. A house on Avonside Drive with cracks in its foundations and the interior wall of its porch as a result of the 4 September 2010 earthquake. 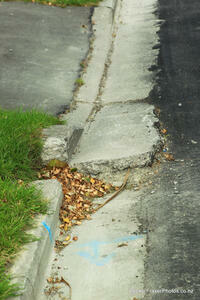 Cracks can also be seen in the asphalt of its driveway. 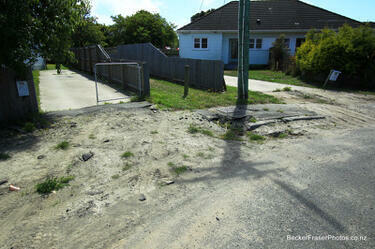 A badly damaged footpath at the end of Acland Avenue in Avonside. Dried liquefaction silt can be seen covering the pavement.